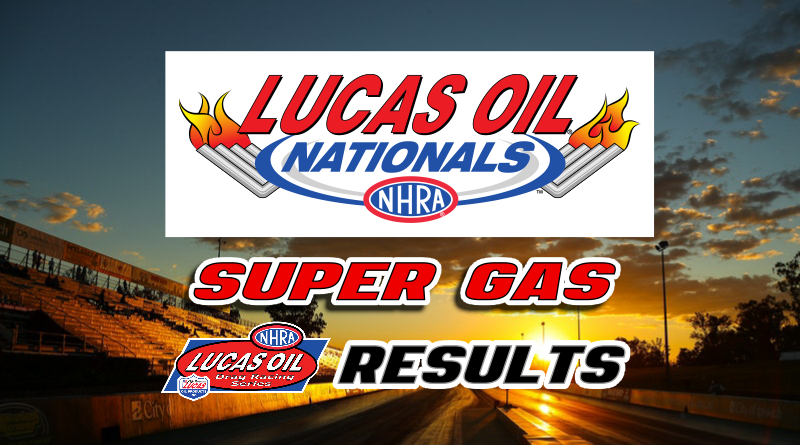 BRAINERD, Minn. – The Super Gas final at the NHRA Lucas Oil Nationals included two first time national event finalists. Jeff Crooks of Brandon, Manitoba, captured his first national event Wally when he defeated Tom Carlson of Two Harbors, Minn., in the Super Gas final. Crooks, driving a ’67 Pontiac Firebird, averaged a .020 light during eliminations and dialed his car honest throughout the event. Crooks opened eliminations with three straight .00 reactions and he stayed above the 9.90 index in every round except the final. Crooks took a breakout win over Kelly Anthony in the first round which Anthony took .015 stripe to go -.008 under the index. Crooks was .008 and ran an all-out 9.931 to take the win. In the second round, Crook’s took a huge starting line advantage over Bill Cawsey, .003 to .040. Crooks scrubbed .02 at the top end to take .013 stripe in a 9.956 to 9.932 victory. Crooks won his third round battle with Austin Siemers using his third .00 light in a row. With a .008 to .016 reaction time advantage, Crooks took the win with his all-out 9.923 after Siemers dropped hard at the stripe (he killed .08) to go 9.952 in the loss. Crooks lucky round came in the fourth when he won a dead-heat against Scott McMasters. Crooks trailed off the line when McMasters put up a .000 light against the .036 of Crooks. At the finish line, Crooks took the stripe by .036 to go dead on 9.900 for the win. McMasters posted a losing 9.936. This race was decided by less than .001 and what made it more interesting is neither driver lifted, they both ran it all-out. In the semifinal, Chuck Wescott had problems on the line, posting a .152 reaction time, allowing Crooks to take the easy win and move into his first national event final round. On the other side of the ladder, Tom Carlson, driving his ’03 Corvette roadster, was making his first appearance in a national event final round. Carlson, who was setup on a 9.88 for most of the race, took a breakout decision of Tim Tiry in round one. After both racers posted .034 reactions, Carlson dropped at the finish to a dead on 9.904 while Tiry took .032 stripe to go -.028 under the index. Carlson hit another .034 light against Rudy Matthews in the second round and paired it with an all-out 9.930 for the win. Matthews .020 reaction gave him the advantage off the line but he slowed on the top end, killing .06, to post a 9.961 in the loss. After picking up red-light wins in round three and four over Chad Dickey and Kevin Burnett respectively, Carlson moved into the semifinals to meet Daniel Gilgosch. After both drivers left within .001 of each other, Gilgosch ran well off the pace posting a 10.049 which allowed Carlson to ease up to a 9.918 and move into his first final round. The final round ended quickly when Carlson fouled by -.005 handing Crooks the win. Congratulations to Jeff Crooks on your first national event win!